To make a Latte, you need to first start with frothing your milk, make sure that the milk, and the frothing jug are cold. Steam your milk to the correct temperature, but for a Latte, you just need to heat the milk, you do not want any froth, and set on one side. 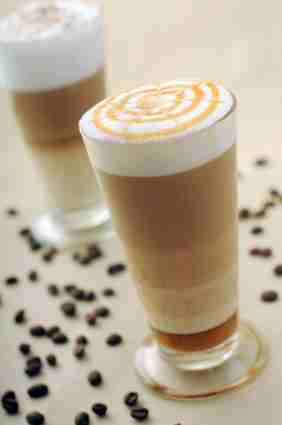 A Latte should be served in a ‘glass’ so that you can see the different colours of the coffee and the milk. Pour the steamed milk into the Latte glass up to about 7/8 of the glass. Now the main bit, get a tea spoon, and hold over the milk, and pour the espresso shot into the spoon, by doing this the espresso will float on top of the milk, and give a great look.